As regular magazine readers may know, I have not succumbed to the blandishments of surround-sound in my own listening room. But I still look at Shows for that convincingly magic experience. Listening to Ray Kimber's four-channel Isomike recordings in his 35th-floor room at the Venetian was indeed magic, though that was due in large part to his DSD-encoded masters capturing the appropriate spatial information. 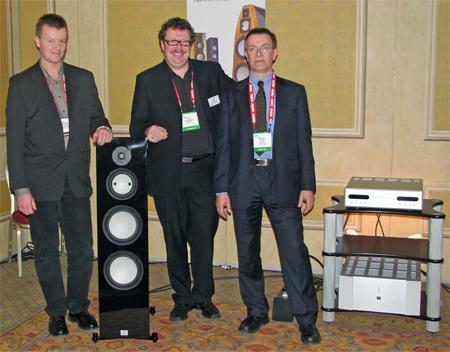 But across the hall, TAD was showing off a surround system comprising five of its Reference One speakers ($60,000/pair), driven by Pass Labs amps with a variety of commercial recordings, from two-channel to multichannel on SACD. The unquestionable sonic high point of my second day at CES was the opportunity to hear two of the larger, floorstanding speakers in the line that has already brought us the much-touted $20,000/pair Magico Mini "bookshelf." The largest and most expensive of the pair is the $120,000/pair M6 (Model 6). First released one year ago, this four-way floorstander includes three 10" woofers, one 7" mid-bass driver, one 5" midrange unit, and an air motion-transformer tweeter. Weighing 650 lbs, with an enclosure of extruded aluminum, the speaker is said to extend from 28Hz to 50kHz, with a 90dB sensitivity and a 4 ohm impedance. The M6 recently won the Grand Prix Award from Japanese magazine Stereo Sound, and was featured on the cover of its December 2006 issue. 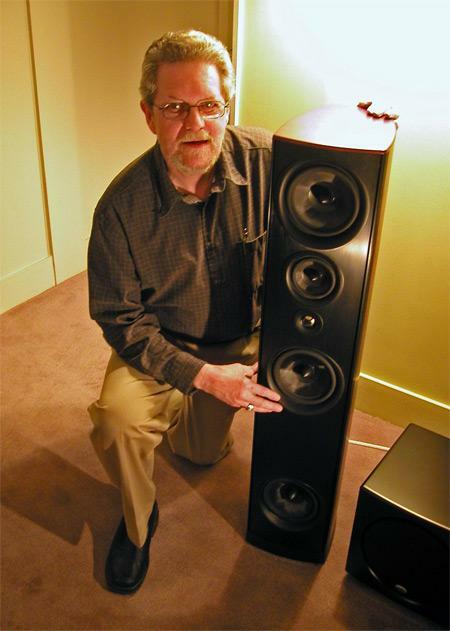 Canadian speaker company PSB has majored in high-performance affordable speakers, with its tiny Alpha, introduced in 1992, becoming on of the best-selling speakers of all time. 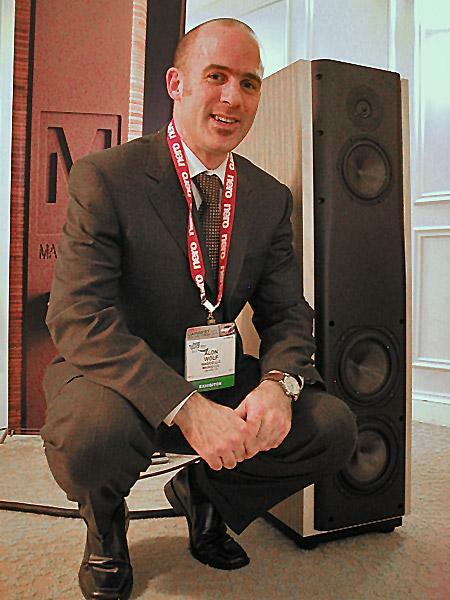 Designer Paul Barton (above), however, has been working on a flagship PSB speaker, which he demmed at the Lenbrook suite at the Hard Rock Hotel. Yet to be named, the new speaker will cost a still-affordable $4500/pair and spearheads a new line of six models to be introduced in the second quarter this year. Covering a Show as large and as geographically diffuse as the CES invariably leads to moments of writer brainfade. I auditioned Sonus Faber's new Elipsa loudspeaker in the Sumiko suite at the Venetian on Tuesday evening just before the Show closed but had run out of space on my camera's memory card. Back in my hotel room Thursday evening, after the Show had closed until January 2008, I found my note to myself on my PDA reminding me that I needed to take the Elipsa's photo for this report. 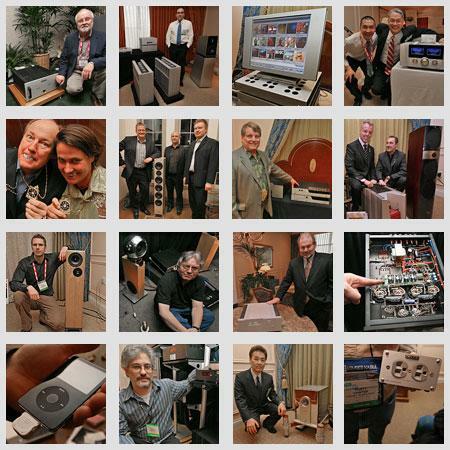 So words will have to suffice, I am afraid, as well as a link to Sonus Faber's website. You'd think there was not much more to say when it came to horn speaker design. Yet there, in one of the Venetian's 29th-floor rooms was audible proof that progress can still be made. 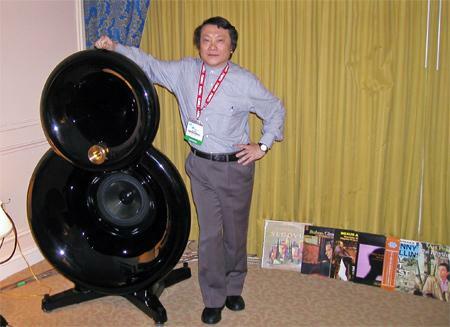 Designed by Japanese engineer Tetsuo Kubo (above), the Kubotek Haniwa SP1W33 horn speakers ($60,000/pair) use Electrovoice drivers loaded with midrange and low-frequency horns that continue the Tractrix flare around to the rear of the horn to minimize edge reflections. A separate DSP processor, the FPIC-100 Sound Signal Controller is used to correct the horns' phase characteristics independent of the amplitude response. Having waxed ecstatic over the big Märten full-range loudspeaker on display at last October's Rocky Mountain Audio Fest, I was delighted to discover the somewhat smaller $30,000/pair The Bird on display in two virtually square, air-walled conference rooms at the Sands/Venetian Convention Center. The three-way speaker, with a 6 ohm impedance, boasts a frequency range of 28Hz–45kHz, and is 89dB sensitive at 2.83V. Needing a shot of the real thing after a particularly disappointing dem from another manufacturer, I headed down the hall to hear Aurum Acoustics' total package. ($48,000 gets you the Integris CDP CD player, Integris Active 300B amplifier and speakers, Integris two-shelf Isolation Rack in matching veneers, 2m power cable, Aluminum Base kit, and Loudspeaker Grille Kit. As I said, the whole package. 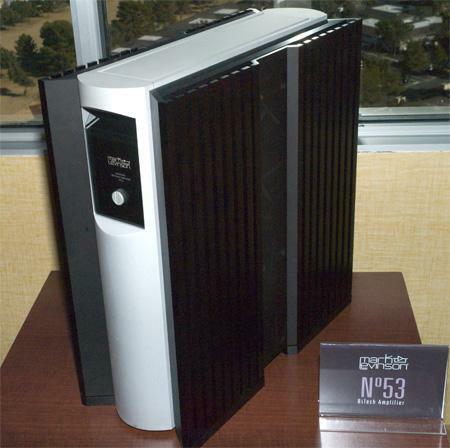 Mark Levinson showed a design study for its Reference No.53 monoblock amplifier in its Hilton suite, which will replace the previous flagship, the No.33. Although details are not finalized, Levinson's Walter Schofield suggested that each monoblock chassis will be rated in the neighborhood of 500W into 8 ohms, and will be priced at approximately $20,000. 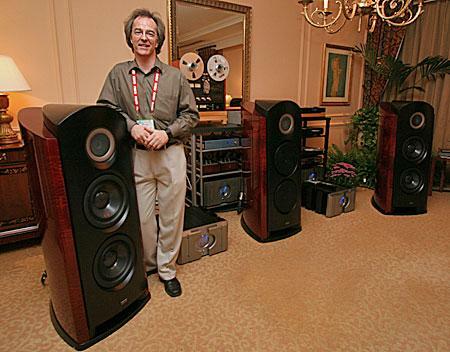 After 10 years of selling the $15,000/pair Ultima Salon as its flagship speaker system, Revel introduced a redesign, the $22,000/pair Ultima2 Salon, at CES 2007. 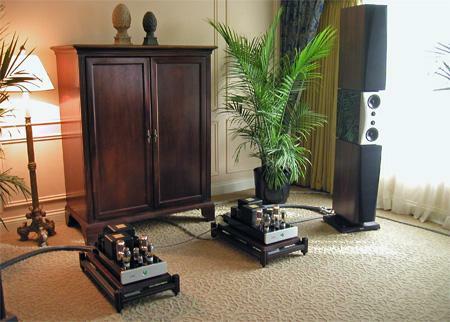 When I reviewed the original Salon, I was very pleased by its bass extension and dynamics. 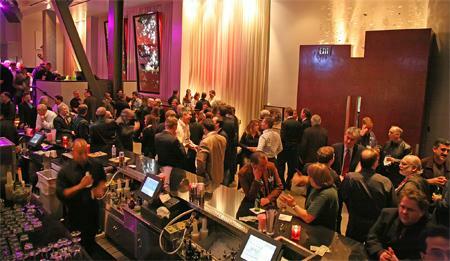 What's new in the Mk.2 Salon? It has a more conventional look, and employs all-new drivers that performed better in double-blind tests conducted by the manufacturer. While retaining the basic configuration—a four-way design with one tweeter, one midrange, one mid-woofer and 3 woofers—the Salon 2 no longer has side panels, a rear-firing port, or a rear-firing tweeter. 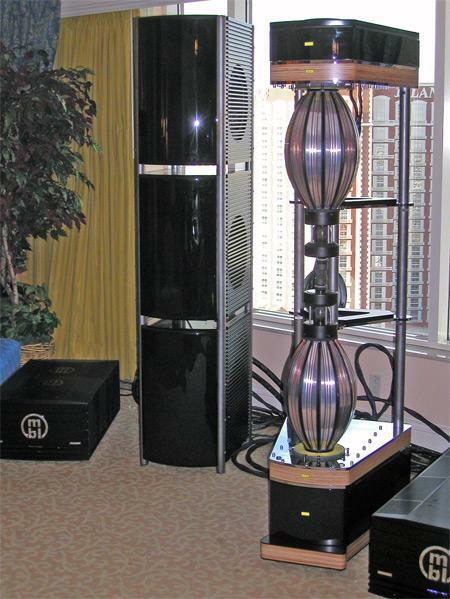 Revel had a pair of the Ultima2 Salons playing in a demo room at the Hilton, driven by a 200Wpc Mark Levinson No.433 amplifier via Transparent speaker cable, a Levinson No.32 Reference preamplifier, and a Levinson No.390S CD processor. The loudspeaker played with all the dynamics and excellent LF response of the original Salon, reproducing the powerful deep bass of the organ accompaniment to John Rutter's Requiem. There was also a richness and smoothness that I found very pleasing. I fell in love with the sound of the unique omnidirectional mbl tweeter when I reviewed mbl 111 loudspeaker in August 2002, so I always treat my ears by visiting the Berlin company's room the last morning of a Show. 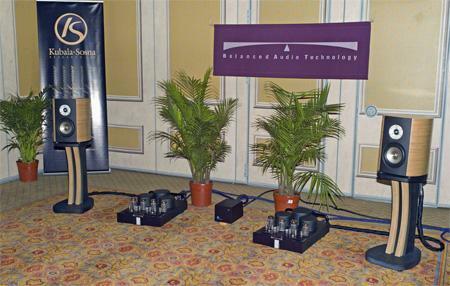 At the 2007 CES, they were showing this: an assault on the state of the speaker art based on two the mbl 101E's upper-frequency modules mounted on top of one another, with separate active woofer towers. The excess of glass in the hotel suite led to a rather uptilted high-treble balanced, but the presentation was as awesome aurally as it was visually. 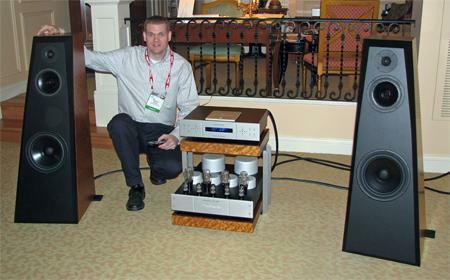 BAT introduced the two-chassis, $18,500 REX preamplifier at CES. The 18-tube preamplifier incorporates vacuum-tube rectifiers, C-multipliers, oil capacitors, and shunt regulators to filter the power supply's DC voltages. The control module incorporates a 140-step volume control that uses a 16-bit digital control with Vishay bulk-metal–foil resistors as pass-through devices. Each input to the preamplifier can be adjusted individually. I looked into the Cary Audio Design room in the Venetian Towers to catch up with designer Dennis Had to find out what the North Carolina company had been up to since I visited them a year ago. But he was out, so I settled back to enjoy some fine music on Dynaudio Confidence C4 speakers—favorites of mine since I reviewed them in September 2003—driven by the 10th-Anniversary Edition of Cary's CAD805 single-ended triode monoblock, perhaps the finest-sounding of its breed. Source was the CAD-306 SACD player, back in production after some manufacturing problems with its Sony-sourced chipset. Nice. Very nice.